Chiswick Quay is a small estate of 68 town houses surrounding a marina on the river Thames. Every house overlooks either the marina or the river. The roads on the estate, Chiswick Quay and Ibis Lane, are cul-de-sacs off Hartington Road. Living on Chiswick Quay or Ibis Lane, getting up in the morning to have breakfast on the terrace, looking out over the marina or the Thames is like being on holiday in the Mediterranean. This is probably one of the most attractive places to live in London. Chiswick, on the north bank of the Thames, is a fashionable area with a wide variety of shops and restaurants. It was developed after the opening of the main-line railway from Waterloo and the District line in the mid nineteenth century. Most of the properties in Chiswick are Victorian or Edwardian, and range from small artisan cottages to the large Norman Shaw houses in Bedford Park. However for those looking for contemporary space the choice is limited, and Chiswick Quay design meets that need well. Chiswick Quay was developed in 1974 around a lake and its banks which, like much of the rest of the Grove Park Conservation Area, was originally part of Lord Burlington's Chiswick House estate, but later owned by the Dukes of Devonshire. The lake has been turned into a marina with lock gates giving access to the Thames. 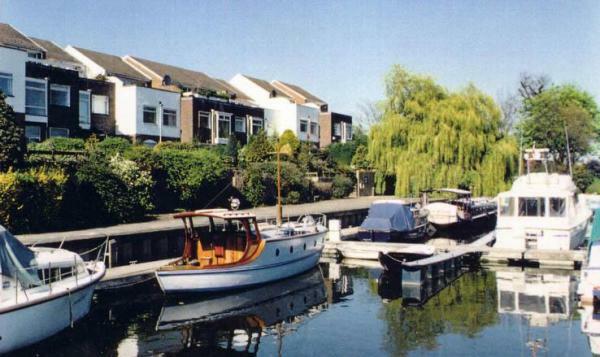 For boat owners the marina is especially attractive, being very secure as it is overlooked on three sides by houses.